Celebrities hunt for antiques across the UK. Hilarity ensues as veteran comedy duo Tommy Cannon and Bobby Ball hit the antiques trail in North Yorkshire and auction in Harrogate. Browse content similar to Tommy Cannon and Bobby Ball. Check below for episodes and series from the same categories and more! -All breakages must be paid for. -This is a good find, is it not? Got my antiques head on. I think it is horrible! -This is better than Christmas! and driving away in this classic car? -That is nearly as old as you, Tommy. -There is nothing as old as me. Oh, yes, it is none other than legendary comedy double act Cannon and Ball. -Or, as they like to be known, Tommy and Bobby. You know, I'm going to let you drive. -Hey, first time I've won anything. Long before Ant and Dec, these guys were the kings of Saturday night TV. recognisable across the country, and let's not forget that catchphrase. -Get your legs up! Rock on, Tommy. when they went into the jungle in 2005. These evergreen talents are driving a gorgeous 1965 Sunbeam Tiger. -I've never won anything with you. I'm A Celebrity...Get Me Out Of Here! What happened? I went out first. Cookery programme, I lost on that. So I've never won anything, so today... I'm going to beat you! Well, Tommy, help is at hand in the form of two august experts. 1974 Beetle is military-mad auctioneer Paul Laidlaw. His co-pilot is auctioneer James Braxton. -How's your knowledge of your celebrities, boys? and sort of slightly... I thought his humour sort of ran slightly higher. Is Bobby not the small one with the moustache? Oh, jeez, we're in deep water if we don't know who we're talking about. I hope they are not snobbish. Oh, they won't be snobbish, they are good lads. -I think so, aye. I think so. -How long has he been lying low? -but will they know their Cannon from their Ball? Hello, gentlemen, how are you? -Good, nice to be here. -We have the same hats. -I can't believe it, can I? Can't believe it. -We're doing this thing, it is me and thee. -And James is looking after me. but I don't know anything about antiques. He's beat me on everything we've done in show business. -This is the day you die! Well, we're going down ahead of you. and this is already shaping up to be an interesting trip. "if we can get it for that, we could maybe make a buck." -That's it. There's our double act. A good double act. Paul and Ball. Don't let Tommy hear that, Bobby. I need to beat Mr Ball. I've got to beat him. -You will do your best. -I will do my best. That's all I want, because I NEED to win. -This programme will split the act up. 52 years, nobody has ever split us up. I've known him longer than I have known my wife. -Are you sure about that? our two pairs will be travelling more than 200 miles through Yorkshire. before ending up at auction in the spa town of Harrogate. home to the towering York Minster Cathedral. the city's fortunes were made by railways and chocolate. -This is the moment when Mr Ball goes down. Our first shop for both teams is Red House Antiques. And first over the threshold are Tommy and James. The shop is run by Tim. -I live here and I've never been in the shop. -I'm going to slap it. -Not nice that. Not nice, that! -But I'll look after you. No pain, no gain in this game, Tommy. But watch out, here comes the competition. -Thank you. I'm a bit nervous. No need for nerves, Bobby, I'm sure Paul will keep you straight. -What about that jade boat? -Why do I like it? It's different, isn't it? is ticketed as jade, currently very popular in China. The asking price is £275. It ain't, in my opinion, jade. -even allowing for the fact... See AF? That terminology - As Found. -it's saying, "Have a closer look, ladies and gentlemen, because there are issues with it." -All right, we'll leave that, then. -Moving on, then. Thank you. -What else will Bobby spot? Hang on, but look at the price he wants, he wants 365 for it. Yeah, but look at the provenance as well. Provenance - The London Museum of Curiosities. That would be worth every penny of that in the right quarter. -Would you not buy that? I would, you see. You can say to people, "I've got a three-headed duck." It's fantastic, really. -I'm not very good at this, am I? But how's the competition getting on? -I like that. That's a big fellow, isn't it? -Sort of... It's moulting, Tim. -It is moulting a little bit. -Are you all right there? Yeah. but it's not terribly old. But it doesn't seem to matter so much. -Why does it not matter? Because it's jade? but James thinks this is the business. it's almost like something that you weigh and you buy on price. -It seems to be a funny thing at the moment. Get him off. You're going down! You're going down! You're going down! -I've already checked into this. -And on the card it says AF. Am I right? -which means it's not worth the money because it's broke already. -OK, thank you. Words of...wisdom. -You need to go away. -Will he be repeating those at the auction house when the hammer's gone down? Bobby's warned them, but what are they willing to pay? -You're hating that, aren't you? -Yeah, we are hating it. -I think we can squeeze him further, Tommy. -160 and we'll take it? I'm not taking any notice. 140 and I'll get you a ticket for one of t'shows, all right? -I'll throw that in. I'll throw that in. -You've got yourself a jade boat. -See what it does at the auction. -I wanted to buy that and my expert said don't. -My word! They're all getting rather excited. Tommy and James have knocked Tim down to a generous £140. if it's jade, that is, and not just a junk junk. Bobby is still keen on the man-made three-headed duckling, though. -a sheep with two heads. -I've never seen anything like that in my life. -You don't want to see another one either, do you? This taste for the bizarre is in vogue. -No two ways about it. -So, arguably your feelings towards that work. -I think we should take a punt. Now, priced up at £365. I kid you not, I'd want it to be closer to £100 than £300. -let's see what he has to say. -We need to have a conversation, don't we? It could be a difficult conversation if they want £265 off the ticket price. -So it's 365 at the minute? -Terrifying. More terrifying than a three-headed duck. It's quirky and it's a little bit different. -It's something you are not going to see every day. Well, how much do you want to give me for it, Bobby? -How do you put a price on that? And that's a powerful lever but, I tell you what, it leaves it all up in the air. But you certainly can't put a price of 365 on it. It's a hell of a discount, 365 to 150. -150? I thought I said 120? Oh, give us your money. -I think you've just bought something. -You won't go lower than that? -No, no, no. That's it. -This is the point of no return. -Are you buying it? Shake me hand. Give me your money. but will it fly at auction? -it could be all right. So that was Ball, but what's Cannon up to? If you look at it, porcelain is all about condition. Fittingly for York, they've found a pot for drinking chocolate. -Oh, it's from Hungary. Hungary! Have you ever been to Hungary? -Have you? Is it nice? I've been on a diet, but I've not been Hungary. and became known for supplying the royal families of Europe. and this one called Rothschild's Birds is named after the famous banking family. -What's the deal on that? -It's got to be low, Tim. You've got to give us a chance. You know what I'm saying here, Tim, don't mess us about. -I'm sort of 30, 40. -Can you not do 70? -I think there'll be a beautiful posh lady in Harrogate desperate for that. -It's a deal for me. Oh, sorry, Tim. -He's the man, I'm not selling it. -Go on, that's the way. -It's a deal. It's done. -It's all about the posh porcelain. Another bargain in the bag there. These two are shopping up a storm! -Well done. Yeah, lovely. I like a man hug. Come on. -I feel a bit of bromance. -He's going down. Come on. Sounds like a new catchphrase, Tommy. But out on the road, the boys are talking about Bobby's old one. I get that all the time. "Rock on, Tommy." And then they go, "How are you, Tommy?" I say, "I'm not Tommy." "But you said rock on, Tommy." I say, "That's Tommy, me partner, I'm Bobby. "It doesn't rhyme, does it, rock on Bobby? It's rock on, Tommy." Then I get a whole conversation with them. So now I just nod me head, "Aye, all right." Like you've never heard it before. are adventuring 14 miles west to Barmby Moor. -How long have you and Bobby been together? we don't know whether we are the longest-serving double act in the world. And there's every chance that we could be. So Guinness Book Of Records are looking it up. where Dominic will be showing them around. Nice shirt. -Let's do it. Come on. -Come on with us, Dominic. Come on. Come on with us. it's himself in a rather fetching wrestling outfit. and we had Big Daddy, who was a big lad but he was a massive wrestler in the '80s. And he came onto our show. They used to knock hell out of one another. And then they used to get the hell knocked out of them by the ladies with their handbags. I know, the ladies used to be smacking 'em with bags and all sorts. -I'm sure they had bricks in some of those. -Yeah, I'm sure they did. but I couldn't do it with Big Daddy, he was huge! But, oh, what a memory that is. Nice memories, eh? How about this for another blast from the past. -Well, it's definitely of the period, isn't it? -A good likeness, I mean. -You know, sometimes you don't get 'em as a good likeness. but anything featuring the Fab Four can still be popular. -you collect pretty well anything, don't you? -They do, any Beatle memorabilia. It might be the missing link in somebody's collection. OK, that one's a possible. -I think it's a matter of just finding that thing that leaps out first. And what's the last thing you want leaping out at you? -How about an ancient brick, guys? What, and somebody's put their hand on it or foot on it? "Very old handmade clamp brick with dog print." -I think that's a possibility. I like that. stacked around a slow-burning fire. -Yeah, ridiculous price. Come on! Let's put that aside. That could be a possibility for us. With two items shortlisted, it's time for a sit down and a think. Where better to do it than under the Yorkshire sun. Oh, thank you, sir. I eat 'em in doubles. Thank you very much indeed. Look at that! The only reason I wanted these was so I could dunk 'em in me tea. Hey, shouldn't you be talking antiques, you lot? -I never quite got dunking. -Oh, I love it. Do you not like dunking? -When all the bits drop in your tea. -Oh, I love it, me. I love it. I love dunking. OK, boys, let's quit the dunking and get back to the deal. What can Tommy and James get the plate and the brick for then, eh? -Here are our two Bs. -We're going to Harrogate, it's posh. -You know what I'm saying? Very, very posh. It's Sunday afternoon in Harrogate. Posh lady, will she buy that and put it in her handbag? -Yeah, but have you looked at the price? Help is what we need. -It's quite a nice engraving. It's a good image, but it is mass produced. -Yeah, but how many are left? -Erm, that is the problem. -Possibly. What do you think? -So £28, 32... That's a lot of money! -We can do a deal. -Right, come on then. Do it. -For the both of them. -For the both of them? Yeah, I think that's all right. Are you happy with that? -Come on, put it there. "Easy," as Big Daddy would say. That's the Beatles plate for a fab price of £12 and the brick for 13. Let's hope it isn't unlucky at auction. I just hope the people of Harrogate appreciate the beauty in that brick. Well, they'd better do, I'll tell you now. And on that note, it's time to bring the curtain down on both our double acts. but the rain hasn't dampened the competitiveness of our celebrities. And I warned your expert. I said to him, "Let me tell you something, I know where you live." -"If you even think about letting him win..."
Tommy, you're 70-odd, you're not Mafia. What do you mean I'm not Mafia, I'm the Godfather! -Tommy is absolutely delightful. Old pros, aren't they? I think the demeanour could... could change somewhat. It could turn ugly. It could turn ugly if Bobby's put on the back foot. the rather unique, or terrifying if you're Paul, three-headed duckling. That leaves them with £250 to spend during the day ahead. I'm not very good at this, am I? Tommy and James spent £220 on four items. the Beatles plate and the clamp brick with paw print. That leaves them £180 left to spend. Cor! Look, this place looks posh. You know, I look at that and I think, I wouldn't want to mow it! -I just wouldn't want to mow it. -You've got minions for that, haven't you? James may have minions at home, but on the road our celebs are in charge. You all right? You all right? Well done. Well done. -You are today, Paul, because your driving yesterday was superb. and are travelling 15 miles to Pateley Bridge. -What's Tommy said? Is he sitting pretty? Is he cocky? And he kept saying, "Don't worry, if I don't win I know where you live." I said, "You what?" He said, "I know where you live." I said, "Who do you think you are, Mafiosi?" He went, "Yeah." Well, there wasn't a horse's head in my bed last night, thank goodness. He'll be looking in antique shops for a horse's head. I had enough dead animals yesterday, to be honest with you. to an array of artists including sculptors, glass-makers and metalworkers. Bobby and Paul are heading into Crow's Nest Antiques and they have a plan. The shop is run by the lovely Linda. -Just give me a shout if you need any help. -Thank you very much, my love. -Right, are we sticking to the plan? but who will be the first to beat a path to a bargain? I don't think they're me. I don't think they're me at all. But maybe this Victorian standard oil lamp might be. -I think this is absolutely beautiful. -I know, it's gorgeous, isn't it? -But there's no top to it, is there? -No, there isn't a top to it, Bobby. -So what's the use of it then? -You can get that off the internet. -You can get the oil off the internet now. -and then you fasten it tight again. -You can see by all the marks, it's been up and down. Does the price go up and down? I don't know, I'm just asking a question. -No, the price goes up as well. -Does it? Does it ever come down? -OK, we'll talk about it later. and it's nowhere near what Bobby wants to pay. I want to try and get her down, but she doesn't know that yet. She's a lovely woman, but it's a bit dear. Paul has also spotted something he rather likes. This Victorian long box where a lady would keep her evening gloves. It's an unusual thing, is it not? But, wait a minute, what do we have here? to perhaps stretch the leather. And your tool to stretch your gloves is here. squeeze, squeeze, and there you go. So you've got the box, the gloves and the accoutrements. And who doesn't like a little bit of leather of an evening? Hey! But there's another little twist to this glove box. And the clue is this key. perhaps driving a musical box. And that's what you've got! That transports you, does it not? Therein is the joy of antiques. Man! I'm back in 1870, getting ready to go to the ball! And the belle of the ball's getting her gloves on! I love it! Do I love the price? At £195, love comes at a hefty cost. The question is, how much slack is in that price? because both the glove box and the lamp are priced at £195. -With only 250 left, something has to give. -Linda, have you got a minute? -First of all, I want to talk to you. Listen to this, I find you a very, very attractive lady. -What's the lowest price you can go on this? -I can do you a really good price on this, Bobby, actually. -I am looking in your eyes, don't worry. -I think we can go for that. I'm not saying yes yet, but it's very good, because you're beautiful, absolutely beautiful. -What's the price you can give us on this? -Now then, this, I can't do too much on this. -But remember you're giving it to Bobby Ball, that's what you're doing. Who's made you laugh for many years - for nothing! -I haven't got a lot in this. -I haven't. I haven't got a lot of play in this. So I can do this for 160. £10 to buy any more items. -But there might be a solution. -So a bigger deal, more things, might squeeze a wee bit more out? You can, Paul, but it had better be cheap. -This isn't silver, is it? -It isn't, no, it's silver plate. -I couldn't see a price on it. -Right, the price of this is £32. is very similar in style to that of the modernist designer Christopher Dresser. I think that's a good, safe-ish bet. I can tell you for nothing, that's a gamble and so is the lamp. My question to you is...are you a gambling man? Are you prepared to gamble on good things that have got a fighting chance? If it's going to help you, then I'll do the lamp for 60. -Of course it does! Manna from Heaven! He's getting excited. He does this, he gets excited. That's three items they've managed to squeeze into their budget now. -Could they manage a fourth? -Is there anything else? Did you look at those spoons? I did look at those spoons! I did look at those spoons. Are you serious? Are you reading my mind or are you watching me? They're quirky, they're interesting, they'd look fantastic in a kitchen. They're a nice decorative item, I think. So, it looks like the free ladles with a ticket price of £9 each are part of the deal now, too. Linda must be in a generous mood. -For the lamp, 60 quid. And...for this little set, £20. -For the musical box, 140. -That's just ten under their budget. Can Bobby's charm wring any last-minute concessions out of Linda? why don't you give us these three for ten quid? And that'll give us a fighting chance. Otherwise, Tommy beats me. What a double act, eh? They have been bold and they've spent big. which still leaves them with £20. That is great work, chaps. -Nice to meet you, Bobby. -All the best. Good luck. -And I'll be watching and I hope you win. Tommy and James have headed 87 miles north to the very heart of North Yorkshire, Richmond. -It never gets any easier getting out of this, does it? -You bang your head, everything. -Let's hope you didn't bang it too hard. York House may be the last chance to buy antiques today. Luckily, owner Christine is on hand to see them all right. -Nice to see you, darling. The boys still have £180 left and not a lot of time to spend it. -This is nice, isn't it? You know, it's all about searching, isn't it? -..is this little fellow. It's sort of Edwardian, late-Victorian. -but it's missing a stopper. So, why would you have that? You'd have that to stop evaporation. -So it'd be something like perfume, so something alcohol based that would evaporate. -Well, it's nicely cut, isn't it? -I haven't even looked at that. -We want to deal, though. -We want a real deal. -Go on, you do the deal with Christine. -Go on. You know the form. -Let me tell you...we quite like that. But we could do with a bit of a deal on it. It's a bit low. It's a bit low, that, really. -Thank you very much. That's lovely. -Thank you. That gives us a chance, doesn't it? -And that deal wraps up the shopping. -Thank you very much, Tommy. -I hope you do well with it. in the Victorian spa town of Harrogate. but will there be any brass? Anyway, we'll find out today if I like it. If I win, I'll love it. If I don't win, I'm not a lover. That's the end to it. Not long until you find out, Bobby. consistently charts in polls of the best places to live in the UK. In 2014, they even finished a stage of the Tour de France here. But who will cross the line as winners today? Good morning to you, how are you doing? -I'm good, mate, how are you? -Very good, how are you? -You can't use mine! That's mine, that! Today's auction house is the Harrogate Auction Centre. George Allen has been in the business for nearly 40 years. What are his thoughts on the two more unique items our teams bought? The 19th-century clamped brick. I think a dog's walked through it. Bit different, quirky, very good. Cor, what can we say about this? Who's going to buy it? What do you do with it? Who knows? of what our dynamic duos splashed the cash on. -and spent £380 on five lots. but only spent £250 on five lots. -Hope you do well with it. The room is ready. The phone and internet bidders are poised. -So let's have ourselves an auction. -Watch this, now, this is it. The first item is Tommy and James's Herend porcelain chocolate pot. 30, 20, 10 to start me. Five anywhere. Five, star lot. Five anywhere? Two bid. £2, the bid. -£2. 8 bid. 10 bid. 14? You're out, Bob? The one! All out, done at 15? There's no arguing, that was a loss. That's not helping Tommy's chances of winning. -I think that's a bit of a success. That could be one of the smaller losses of the day! Next up, it's one of Bobby and Paul's items, the rustic wooden ladles. A lot of interest on the book. A lot of interest, commission bids. Oh, deary, deary me. Deary me. £30 bid. On the book at 35. 40 bid. 45. On the book at 45. 45, the bid. Any more? Laidlaw's ladles have served up a tasty profit. Can't believe it. 35 quid. I think you're racing in the lead now. Next, Tommy and James's item, the Beatles plate. 10 to start me, five anywhere? Don't go down to five too quickly. Five bid, £7.50. 10 bid. £10, the bid. Any advance on 10, any more? 15 bid. 15, the bid. At £15. -There we go, three quid profit. -How did I know that? Yes, Bob is right. A whole £3 profit. -But hey, they all count. It's Bobby's oil lamp next. Will it bring a profit? 20 bid. 25 bid. At the back of the room, 30 bid. 35. 40 bid. 45. 85 bid. 90 bid. 95.
Who's an expert, who's an expert? Who's an expert? Me! He's got the antiques bug, all right. And also a tidy profit. Next, it's time for the brick. This will be interesting. -There's a story behind that. It's a brick with a dog's paw in. -We can only go up from there. £50 to start me on the brick. 10 to start me. Five, anywhere? Five bid, any advance on five? -Six, he says. Eight, bid. 30 quid? It's a brick! I can't believe you've all been bidding for a brick! Wonders will never cease. A profit on the brick with the paw print. Oh... I can't get me breath! in the style of Christopher Dresser. What's in a name, I wonder? 20? 10? 5? 5 bid. -I think that's enough, don't you? 10 bid, 15. 15 bid. Any more? 17.50, he's back in. 17.50? 22.50 bid. All done at 22.50? Well done, well done. Profit again. It's a very slim profit, though. Paul had high hopes for that. It's the silver-mounted cut-glass perfume bottle next. Very pretty but will it make money? 5 bid. It's cut glass as well, remember. 5 bid. 7.50. 10 bid. 12.50, 15. 17.50. 20 bid. Well, Tommy, to use what you say, to use what you say, you're going down. Another loss. That is a shame. -I don't know what's happening here. It's Bobby and Paul's glove box next. Paul did admit this one was a gamble. Can we see £100 to start me? 20? 20 bid. £20, the bid. Any advance on 25, bid 30, bid £30 there. 35, 40 bid. 45 bid. 45 bid. Any advance on 45? Any advance on 45? 50 bid. £50, the bid. -55. Any advance on 55? Are you all done at £55? That's a big hit and it's pushed Tommy and James into a strong lead. -I'll tell you what, though, it's fantastic fun. Next, it's the item Bobby and Paul were wary of. -Will the buyers think it's jade? -Another super lot, ladies and gents. -Be careful with that now! -£50 to start me. 20. -Oh, God, we're out again. £80, the bid, any more? -Finished? Sure? At £80, the bid. Bobby did warn you, Tommy. Looks like the buyers weren't convinced either. That's brought Bobby and Paul right back in the race. -You can't win them all. -You can't, I haven't won one yet! It's all come down to the final item and they've saved the best till last. so we have to sell it for at least £100 for me and him to beat you two. The phone bidders are poised, so let's have ourselves an auction! There we go, can we see £100 to start me? -£100? £50 to start me? £10, any advance on 10? -It's all right, it's going up now. -Get the gavel up, mate, get the gavel up. 30 bid, new bidder. Any advance on 30? Are you absolutely sure? At £30. I bought that... I'm walking, I'm walking. -At least Bobby bought it with his heart. That's the first competition I've ever lost with you. Never mind, quack, quack, quack! So, is Bobby right? Let's have a look. Bobby and Paul started the Road Trip with £400. They went for it and spent £380. But after auction costs, made a loss of £226.25. Tommy and James also started with £400. After costs, they made a loss too of £107.73. This has left them with a grand total of £292.27. Some you win, some you lose. Congratulations, my expert. -We've had a fantastic time. -We've had a great time doing this. -And he'll never let this go. -I won't, I'll never let it go. 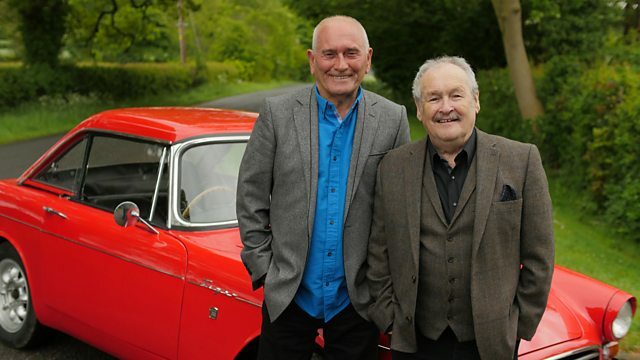 Legendary comedy duo Tommy Cannon and Bobby Ball hit the antiques trail. Hilarity ensues as they shop around North Yorkshire, and the competition hits fever pitch as they converge on the auction in Harrogate.